One aspect that I put a great deal of thought into was the color scheme. At first, I wanted to emphasis rich dramatic colors to emphasize my characters interests in hunting and spirituality in nature. After I created my first image in that style, it seemed to too stern and didn’t visually match my character’s description. 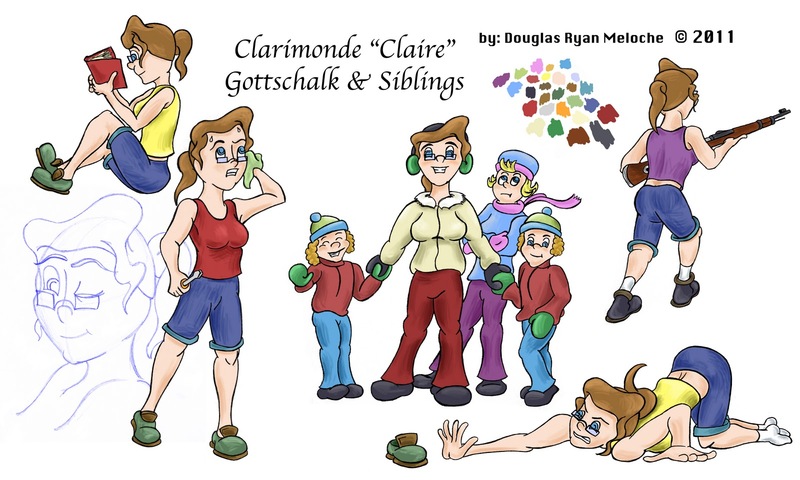 I then shifted my focus towards the family dynamic that’s created by Clarimonde, Claire, taking care of her younger siblings. I looked at German advertisements for children and illustrations for German children’s books and felt it would be more appropriate to use a pastel color palette. To enhance this pastel style, I also adjusted the leveling on the original scannings of my drawings to give them a scratchy chalk appearance. I am happy with the final design that reflects the uplifting attitude of this character.